Handcross Primary school had an Egyptian day as part of its cross-curricular topic on Ancient Egypt. The children and staff in Key Stage 2 came into school dressed in traditional Egyptian costumes and they were treated to a variety of activities to immerse themselves in the topic. Not only did they have to ‘walk like an Egyptian’, they learnt an Egyptian dance and tried out different foods eaten by people in Ancient Egypt, such as flatbreads, dates and watermelon. They made 3D pyramids using straws and they made their own special paper: papyrus. They even used clay to shape into tablets and wrote their name in hieroglyphics. The children rounded off this fantastic day by being treated to a production on Ancient Egyptian life run by the talented Rainbow Theatre company. The children joined in the performance with the cast and thoroughly enjoyed themselves, leaving school that day so excited by their Ancient Egyptian experiences. 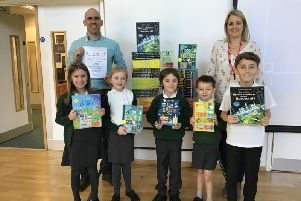 Sharon Bondonno, headteacher at Handcross Primary School, said she was delighted at how much the children had learnt during the day and their writing was so much more detailed the next day as a result.